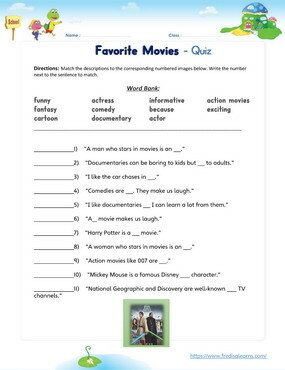 This English lesson teaches ESL kids the names of different types of movies and how to describe movies. 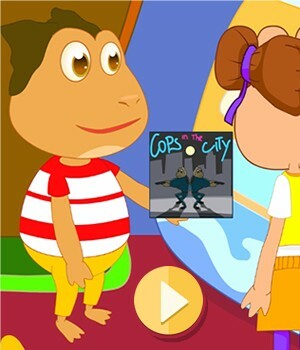 They will also learn how to express preference for different movies and give reasons using adjectives and other expressions. The worksheets below are useful for offline and classroom activities. 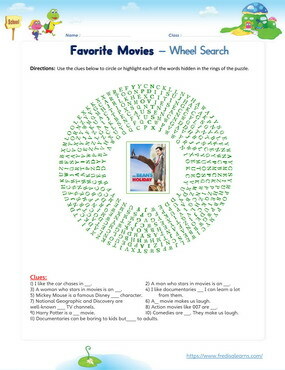 These printable exercises directly correlate with the above lesson 'Favorite Movies'. Every worksheet comes with an answer sheet on the second page for educators. Bob and Sally are at a video rental shop. They are trying to pick a movie to take home and watch. However, they must decide on a movie they both like. Bob likes action movies but Sally doesn’t. Sally likes comedies but Bob doesn’t. In the end, they settle for a cartoon because it is both funny and full of action. Why do you like action movies? I like action movies because they are exciting. Why do you like comedies? I like comedies because they are funny. They make me laugh. Why do you not like documentaries? I don't like them because they are boring. Why do you like documentaries? I like documentaries because they are informative. My favorite cartoon is Tom and Jerry. My favorite sci-fi movie is Star Wars. My favorite actor is Tom Cruise.